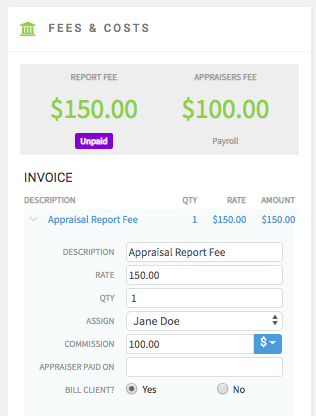 Our latest update gives you the ability to assign each appraiser or contractor in your account with a default flat fee commission rate. To see how this works, begin by going to your Users table by clicking your initials in the top right corner, select Account from the menu, then the Users tab. Next, select which user you would like to update the flat fee commission for, then click edit. Scroll down a bit to the Commissions section of the user profile, and here you will now see a field for Flat Fee rates. You also have the option to set this as the default fee type for this user. Make sure to click save! *Please note that there must be a Report Fee entered for the appraisal in order for the flat fee to be generated in the Fees & Costs section.